Skip the bakery and make these PHILADELPHIA Sugar Cookie Cutouts at home. Adding PHILADELPHIA Cream Cheese to the mix makes these scrumptious PHILADELPHIA Sugar Cookie Cutouts especially Santa-worthy. Beat cream cheese and butter in large bowl with mixer until blended. Add granulated sugar and vanilla; mix well. Gradually add flour, beating well after each addition. Refrigerate several hours or until chilled. Heat oven to 350°F. Roll out dough to 1/4-inch thickness on lightly floured surface. 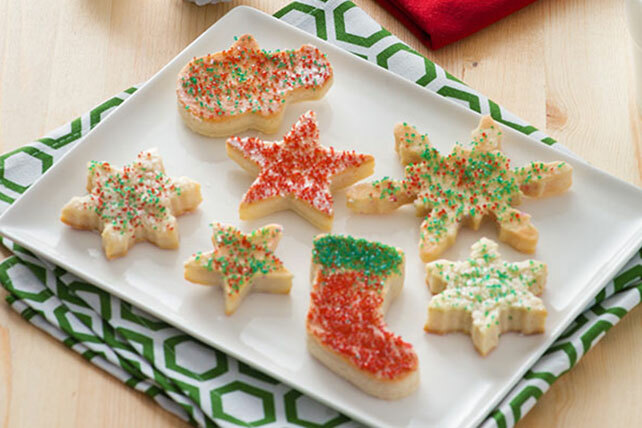 Cut into desired shapes with 3- to 4-inch cookie cutters; sprinkle with colored sugar. Place, 2 inches apart, on baking sheets. Bake 12 to 15 min. or until edges are lightly browned. Cool on baking sheets 2 min. Remove to wire racks; cool completely.